What should I do if I got a message about my phone number being added, changed, or deleted? Phone numbers are temporarily blocked after sending the confirmation code. After adding a phone number, wait for the SMS with the code, or try requesting it again a few hours later. Confirmation codes do not expire. No matter when you receive the code, you can always return to the Phone numbers page and enter it. The system has not yet processed the SMS (the maximum delivery time is 24 hours). Your phone is turned off or does not have a signal. You entered the wrong phone number. Make sure that you entered the country code correctly: +1 is the code for the USA. You can find codes for other countries on Yandex. Yandex cannot send SMS messages to your mobile operator. If you don't use a mobile phone or Yandex doesn't send SMS's to your service provider, you can change your password using an alternate email address or by answering the security question. 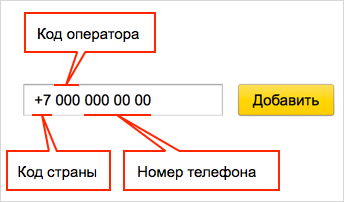 If you are trying to do something with your main telephone number, just continue doing so: Yandex sends email and SMS notifications about all operations for security reasons. Restore account access and change your password. Follow the Forgot your password? link and follow the Yandex.Passport instructions: receive a recovery code and reset your password (when choosing a password, follow our recommendations). Un-schedule the deletion or change the main number on the Phone numbers page. Your code may be sent to another person if you entered their number by mistake or are unlinking an old number that you no longer have access to (and could have passed to a new owner). Your account is under no threat at all: a hacker cannot access your account if they only have your telephone number and confirmation code.